Our keynote speaker at the June 21, 2012 Caribbean Heritage CACCI-Brooklyn celebration breakfast was Lowell Hawthorne, founder and CEO of Golden Krust, which he refers to as GK. GK is a manufacturing operation with 1700 stores, and a huge creator of jobs and wealth in Caribbean communities. I met Lowell at the 2009 CACCI Christmas party" a quiet, thoughtful man from Jamaica. What impressed me about him then is that he was not surrounded by handlers or sycophants, and is clearly a serious man of deep faith that translates into understanding that he has been given the ability to work hard for good. Listen to him speak to other audiences about his ascent from poverty in Jamaica and in New York through to today, click here. 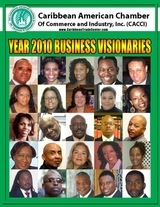 Picture above, Jamaican-born Mr Lowell Hawthorne talks to a Caribbean audience on Jun 21, 2012 about creating a company with funding from his family and accounting education from New York. Videos, listen to him speak.